Auteur(s) : Vereshack, Adam D.
Are you working for a company contemplating a strategic change in business operation? Want to ensure that once a decision has been made to outsource a business function, you will be in a position to negotiate fair and balanced agreements with service providers? 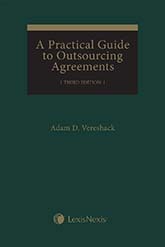 A Practical Guide to Outsourcing Agreements, 3rd Edition is the essential guide book for analyzing the major issues that arise in outsourcing agreements. Author Adam Vereshack has over 35 years' experience negotiating outsourcing transactions for major Canadian and international companies. Guidelines and clauses help you to deal with the basic questions of when outsourcing is an appropriate solution to a situation and what issues must be addressed when contracting with a supplier. All issues discussed are based on actual outsourcing negotiations and agreements. The outsourcing of business functions is a global phenomenon – crossing borders of countries as well as provinces and states. So regardless of where your company is headquartered – Canada, the U.S., Australia, the United Kingdom or anywhere else – if your company is seeking to outsource information technology or business processes, this is the book for you. Revised section on audits of control and security procedures with reference to the Auditing and Assurance Standards Board’s relevant standards. Includes a sample provision dealing with service provider compliance with Canadian and U.S. audit standards. 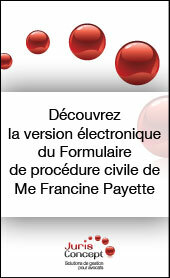 167 internautes ont consulté cette page.